To report a lost or stolen credit card, call 800.449.7728. If you receive a call regarding a blocked transaction on your personal credit card, please call 888.918.7313. With a higher credit limit, 1.00% year-end rebate on purchases, and premium benefits, this is Visa's most elite card. See the application disclosure and card agreement. Looking for a rebate card with a lower credit limit? The Visa Platinum Rebate card offers a 0.75% year-end rebate on purchases. See the application disclosure and card agreement. If you carry a balance or want to consolidate balances from higher-rate cards, the Visa Platinum Value card offers our lowest rate. See the application disclosure and card agreement. 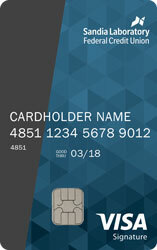 Better protect your SLFCU credit card from fraud with the Card Lock app. Turn your credit card on and off to control when it can be used. Set alerts so you are notified when a transaction has been declined, when your card has been used for an international or online transaction, when you are nearing your credit limit, and more. Set transaction controls, such as defining the geographical locations in which your card can be used and preventing online transactions, international transactions, and transactions greater than a set amount. Available for your Apple® or AndroidTM smartphone. When prompted to enter the last four digits of your Social Security number, use the SSN of the primary cardholder. 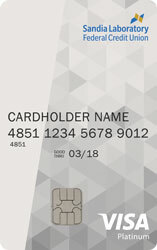 If the other cardholder has already registered your card, use the pre-existing card option. Do not create a new card profile. Apple, the Apple logo, iPhone, iPad, and Touch ID are trademarks of Apple Inc., registered in the U.S. and other countries. App Store is a service mark of Apple Inc.
How to Avoid Paying Interest on Purchases Your due date is at least 25 days after the close of each billing cycle. We will not charge you any interest on purchases if you pay your entire balance by the due date each month. We will begin charging interest on cash advances and balance transfers on the transaction date. Foreign Transaction 1% of each transaction in US dollars. Variable Rate: The annual percentage rate for each card is subject to change semi-annually on the first day of the billing cycle to reflect any change in the Index and will be determined by the Prime Rate as listed in the "Money Rates" section of The Wall Street Journal on the last business day of March and September, to which we add a margin. Any increase in the annual percentage rate will take the form of additional payments shown as Total Minimum Payments on the statement. If the Index is no longer available, the Credit Union will choose a new index which is based upon comparable information. Margin: For the Visa Platinum Value card, Purchases, Balance Transfers, and Cash Advances will be charged at 5.65% above the Index. For the Visa Platinum Rebate card, Purchases, Balance Transfers, and Cash Advances will be charged at 7.90% above the Index. For the Visa Signature card, Purchases, Balance Transfers, and Cash Advances will be charged at 7.40% above the Index.